Practices are Tuesdays from 6:30pm to 7:30pm on April 12, 19, May 3, 10, 17, 24, and 31. Matches are Saturdays at 3:00pm. Locations TBA on April 30, May 7, 14, 21, 28, June 4. Our PGA Junior League Team Program is golf played in a fun team environment featuring team practices & team vs. team competitions. The League is open to both boys and girls in a co-ed format. Girls will also have the option of joining a team which will compete in a PGA Junior League Girls Division. 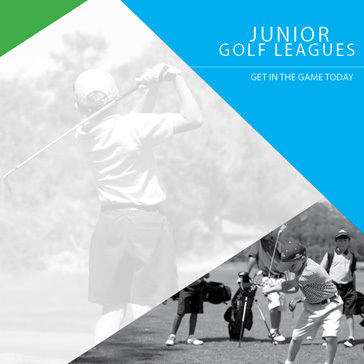 The PGA Junior League format links learning to play and learning to compete. Competitions feature a less stressful team scramble as opposed to stroke-play competition. While PGA Junior League is a developmental league, all children must be able to carry or pull-cart their own clubs, make their own club selections, keep score, and consistently hit the ball forward and in the air. Players younger than 8 will be evaluated on skill level and course experience for inclusion. Players who are younger or new to the game are encouraged to participate in our Developmental League, designed specifically to get new and young players ready to compete on the travel team.